MOST OF THE PIONEERS of abstract art are of Russian origin and the real precursor of it was the Lithuanian Čiurlionis, in 1906-1907”, wrote the renown French art critic, writer, and publisher Fernand Hazan in the Dictionary of Modern Painting. And the internationally recognized Estonian poet, art critic, art historian, and member of the prestigious International Association of Art Critics, Aleksis Rannit, called Čiurlionis “The very first of abstract and surrealistic painters”. Both were talking about Mikalojus Konstantinas Čiurlionis, the great Lithuanian painter and composer whose 120th birth anniversary is being celebrated throughout 1995. According to Rannit, M. K. Čiurlionis belongs to those chosen artists whom fate granted a short span of time to give expression to all the splendor and pain of their souls in a number of, alas, too few creations of art. He compares Čiurlionis with Vincent van Gogh, who like him, had only six years left to complete his life’s work, before madness clouded his mind. Čiurlionis saw the light of the world on September 10, 1875, at Varena, southern Lithuania, and died young at the age of 35 on March 28, 1911. His father was an organist in Varena, and w hen Mikalojus was only three years old, the family moved to Druskininkai, a health resort near the Nemunas river. Here the father took up the post of organist and the young Čiurlionis grew up surrounded by the dreamlike quality of the beautiful natural surroundings of the area. Later he would visit Druskininkai frequently where he would spend the holidays and get inspired. At the age of seven, Čiurlionis, taught by his father, could already read music without any difficulty. After studying at Prince Oginskis’ orchestra school in Plunge from 1882­ 1893 – where he already was composing music – he was encouraged to continue his music studies at the Warsaw Conservatory, from which he graduated in 1899. While studying at the conservatory, Čiurlionis composed a num ber of works including the cantata De Profundis, two sonatas, and a number of short pieces for piano. After graduating he was offered a good position, but declined and went to earn a living by giving private lessons. In 1901 he complete d his symphonic poem The Forest, which won him a first prize at a competition. With the support of Prince Oginskis and other friends, Čiurlionis was able to go to the Leipzig Conservatory of Music w here in 1901-1902 he studied composition. Here he composed the overture Kestutis, which was his diploma work on finishing the conservatory. While in Germany, Čiurlionis went to concerts, attended lectures on psychology, and read the works of Kant, Nietzsche and other philosophers. The homestead in Druskininkai where Čiurlionis spent most of his youth, and to which he kept returning to rest and get inspired, has been restored and converted into a memorial museum. Piano recitals of his music, lectures, and other events are held here periodically. Upon returning to Warsaw, Čiurlionis declined a teaching post at the conservatory, and continued giving private lessons, primarily in wealthy and cultured families. With their financial support, he traveled to the Crimea and the Caucasus, and visited art museums in Prague, Dresden, Nuremberg, Munich and Vienna. The works of Van Dyck, Rem brandt and Boklin m ade an unforgettable impression on him. While still a student in Plungė, Čiurlionis had sketched details of Prince Oginskis’ mansion and park; and in Druskininkai he had drawn landscapes. His visit to the museums of Europe revived his interest in painting. When he returned to Warsaw from Leipzig, he attended a drawing school, and later from 1904-1906 he studied at the Academy of Art under a num ­ ber of well-known painters. Although he wanted to know the principles of painting, he was more attracted to free composition, and his inspiration was enriched by visions from the Bible, the ancient Hindu religion, the works of Tagore, Ruskin, Wilde, Kipling, and others. He impressed the director of the Academy with his unusual works of fantasy, so much that in 1904 a separate studio was placed at his disposal. Čiurlionis’ works were almost always awarded prizes at competitions held by the Academy, which acquired his cycle of six paintings called The Storm. 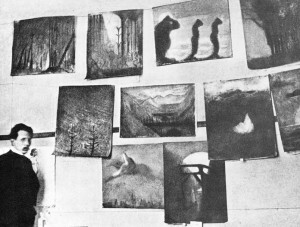 Rare photograph of Čiurlionis in his Warsaw studio in 1904. After 1905, more freedom in the field of culture came to Lithuania, and Čiurlionis decided to return to his homeland “to dedicate all his past and future work to Lithuania”, as he wrote in a letter to his brother Paulius. In the 1909 painting Fairy Tale of the Kings, Lithuanians oppressed by one hundred and fourteen years of Czarist occupation saw Čiurlionis’ vision of a reborn Lithuania. 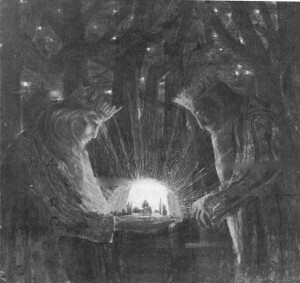 The King and Queen are shown holding a miniature Lithuanian farmstead emerging from darkness. While in Vilnius, Čiurlionis joined local cultural activities. He became an active member of the Lithuanian Art Society, where he organized a music section; conducted the Ruta Society Choir, wrote on music and art in the Lithuanian press; composed music, and painted. His works were put on display at the first Lithuanian national art exhibition held in Vilnius from December 27, 1906 to February 15, 1907. He was the organizer of the second art exhibition, which opened March 12, 1908, and was concerned that there should be a good folk-art section in the exhibit. On this occasion he expressed his opinion on the significance of folk art: “Lithuanian folk art… must be the foundation of our art; and original Lithuanian style must come out of it; it is our pride because the beauty which it contains is pure, original and completely Lithuanian”. Čiurlionis had about sixty of his paintings shown at the second exhibition. But they appeared so peculiar and so far removed from the usual art of the day, that the Lithuanian intelligentsia were unable to understand and appreciate their finest artist. Čiurlionis did not appear to be discouraged by the reception to his art. He spent his summers in Dmskininkai and Palanga, on the Baltic coast, painting new works with great fervor. He also traveled through the province of Žemaitija (Samogitia) paying special attention to textiles, woven sashes, carvings and wood-cuts. 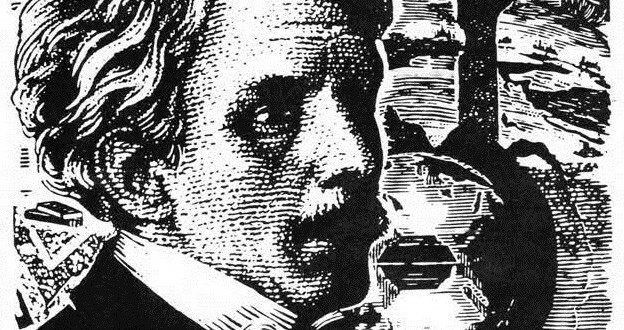 He was later to use folk-art motifs in his engravings. But some what discouraged by poor living conditions in Vilnius, and perhaps by the indifference of his countrymen, in the fall of 1908 lie went to St. Petersb iirg , Russia. While still in Vilnius, he had become acquainted with the writer Sofija Kymantaite, and on January 1, 1909, married her. 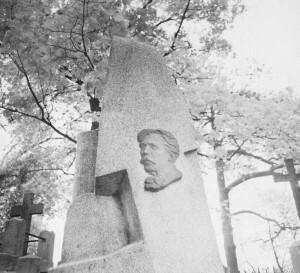 Čiurlionis’ grave in Rasų Cemetery is topped by a granite monument bearing the portrait of the artist. It is a much visited place by locals and tourists alike. Surprisingly, Čiurlionis’ name was already known in the St. Petersburg art circles. His first works had been shown there in 1906 at the Academy of Art, and were well received by art critics. He was invited to join the avant-garde artis ts ’ group “Mir Iskusstva” (The World of Art). He took part in exhibitions and concerts arranged by the group, and distinguished art critics praised the wealth of ideas in Čiurlionis’ work and his rare originality. However, the artist was badly off materially, not having enough money to even buy paints. Besides, his health was poor, and he became chronically depressed. In 1909 Čiurlionis started showing signs of mentalillness, and, at the suggestion of a psychiatrist, returned to Dmskininkai. For a while his condition seemed to improve, but it began to deteriorate shortly after. He was taken to a sanatorium near Warsaw for rest and treatment. Here he caught pneumonia and died unexpectedly on April 10, 1911. His remains were brought to Lithuania and buried in Rasu Cemetery in Vilnius. In music, Čiurlionis made his mark as a composer with exceptional talent and good professional training. He is the first composer to have written Lithuanian chamber and symphonic music. In all he wrote more than 250 compositions for piano, string instruments, orchestra and choir. His most important piano composition is The Sea (1908). However, Čiurlionis is not as wellknown for his melodious music as for his colorful paintings, in which he showed himself to be an original and profound artist of great feeling. He left some 300 paintings and a number of graphic works. Because of his unusually individual style of painting, he stands alone in Lithuanian art. And in the international art scene, he is one of a rare breed of artists who tried to transport music to the medium of painting. Since he began to paint w hen he was already a mature composer, it became natural for him to cany his music over into painting. He not only used the principles of musical com positions in his art work, but also gave musical names to his paintings, calling them preludes, fugues, and sonatas. Čiurlionis did his best art works between 1907 and 1909 while living in Vilnius and St. Petersburg. At that time he passed over from realistic symbolism to a more mystical kind of symbolism, which fitted better the view of the world that he had created. Most of his works are painted in watercolors, tempera, or pastels on paper, very few in oil on canvas. The artist’s modest means did not allow him to acquire more durable materials. Ordinary paper and a thin layer of paint could not withstand the passing of time; some of his most important paintings, especially the sonatas, have faded and lost half of their original silky coloring quality. 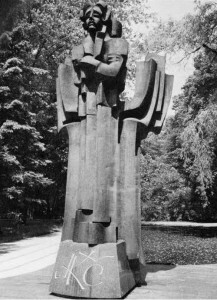 Monument to Čiurlionis erected in 1975 in a Druskininkai park. It is one of several monuments in the health resort city to honor its most famous resident. The sculptor is V. Vildžiūnas. Today, most of the world’s art historians regard the Russian artist Wassily Kandinsky as the precursor of abstract art. But while Kandinsky’s first abstract painting was created in 1911, Čiurlionis’ work shows abstract characteristics as early as 1904. Although his original style caught the attention of art critics early on, Čiurlionis – as was the case with many other creative artists – was not appreciated until after his death. In 1914, the Russian art critic Valerian Chudnovsky wrote that “Čiurlionis’ original individuality in today’s art let us think that he was truly born of the unspoiled forces of his nation”. And in 1916, the Russian art historian Viacheslav Ivanov wrote Čiurlionis and the Art Synthesis, a book about the artist. Other art historians, critics, and poets have shown great interest in Čiurlionis’ work as well. In 1939, the renown art historian Romain Rolland, a great admirer of Čiurlionis’ art, intended visiting Lithuania and writing a book about the artist. The strange painter and com poser w ould thus have become a universal conception. But with war breaking out, Rolland could not cany out his plans, and Čiurlionis was relegated to survive only as a legend on the margins of the history of art. 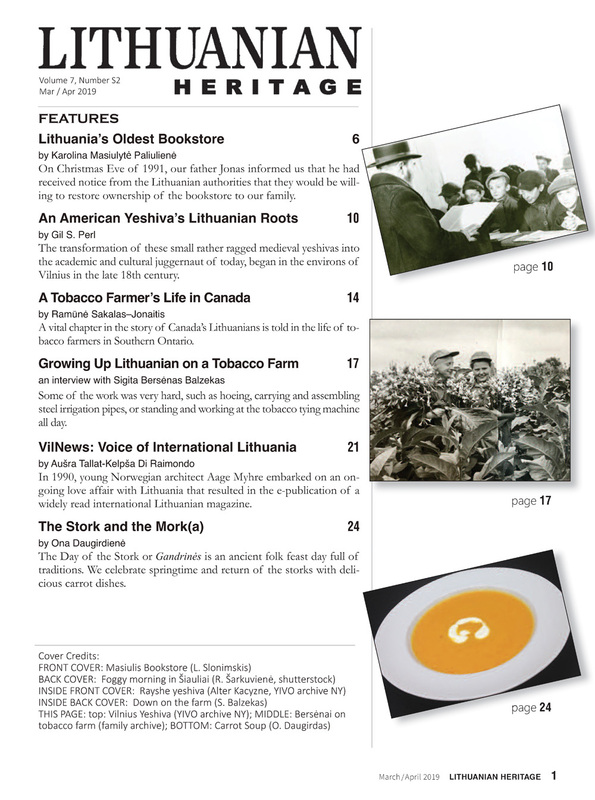 Lithuanians began to appreciate Čiurlionis in a different light only after the restoration of independence in 1918. At the break of the first world war, all of Čiurlionis’ paintings were moved to Moscow to safeguard them from the ravages of war. They were returned after the war. In 1924-1925 a gallery was built in Kaunas, Lithuania’s provisional capital, to exhibit the artist’s works. They w ere later transferred to the Culture Museum of Vytautas the Great in the same city. During the period of Soviet occupation, the museum was re-organized into the Kaunas State Museum of Fine Arts. Reproductions of some of his paintings, and a few recordings of his music were published. An international piano com petition was founded in his honor, which has been held periodically since 1965. An 80-kilometer long stretch of road running from Varena to Druskininkai was named “The Road of Čiurlionis”. Its entire length has been dotted with dozens of sculptures by some of Lithuania’s best known folk artists. A number of statues honoring the artist were erected in Druskininkai and other places connected with his life. But during the entire 50 years of Soviet rule, Čiurlionis’ paintings were not allowed to be shown outside of his own country, and this further relegated the great artist to the fate of the obscure and forgotten. With the beginning of the independence movement in the late 1890s, and afterwards, more and more museums of international stature have shown interest in exhibiting the works of Čiurlionis. Some of the artist’s paintings were shown in Duisburg in 1989, Berlin and Brussels in 1991, Tokyo in 1992, and Bonn in 1992 and 1995. New m onographs and recordings are being published. And the Lithuanian governm ent, as well as UNESCO, have declared 1995 as “The Year of Čiurlionis”. 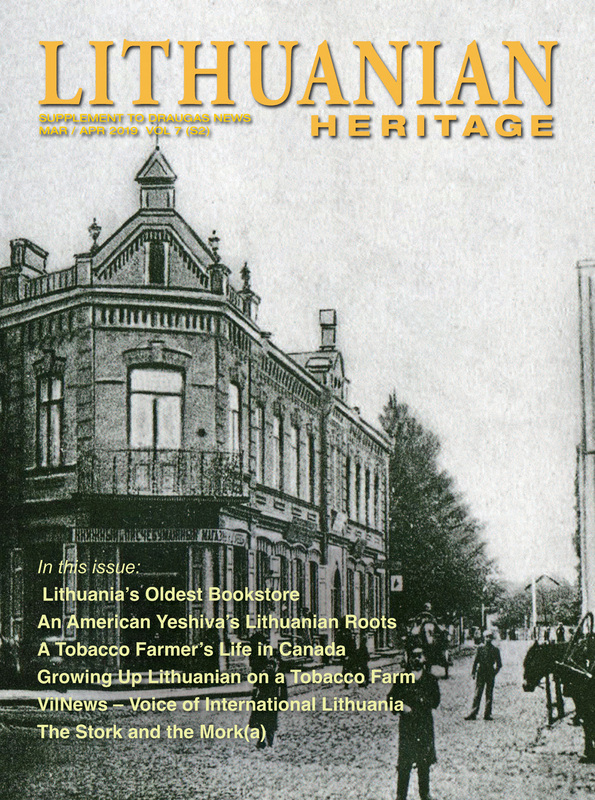 A large number of programs and celebrations were held in Lithuania and other countries during 1995 to com memorate the anniversary, some of which began as early as 1994. In addition to the international piano competition in Vilnius, hundreds of other events such as concerts, lectures, conferences, and exhibits of various types were held in Vilnius, Kaunas, Druskininkai, Varena, Plunge and other places associated with the artist’s life. 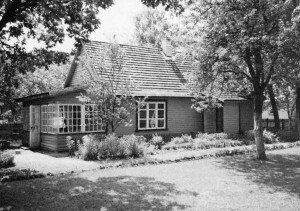 The cottage in Druskininkai where Čiurlionis spent his youth was reconstructed, refurbished, and converted into a memorial museum. The house in Vilnius’ Old Town section w here the artist lived during his stay in that city, was also refurbished and m ade into an art center. The Lithuanian government issued a commemorative 50-Litai coin in his honor. 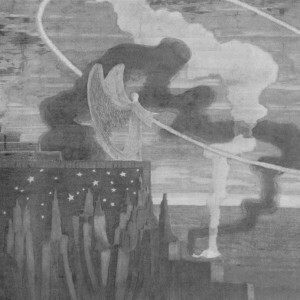 And the stage curtain, which Čiurlionis painted with his wife’s help for the Vilnius Lithuanian Art Society “Ruta” concert hall in 1909, is being exhibited for the first time ever at the Lithuanian Art Museum in Vilnius.